Nurture Your Health: Happy New Year!! With the start of a new year, I have started my yearly (since I think 2001?) January cleanse! 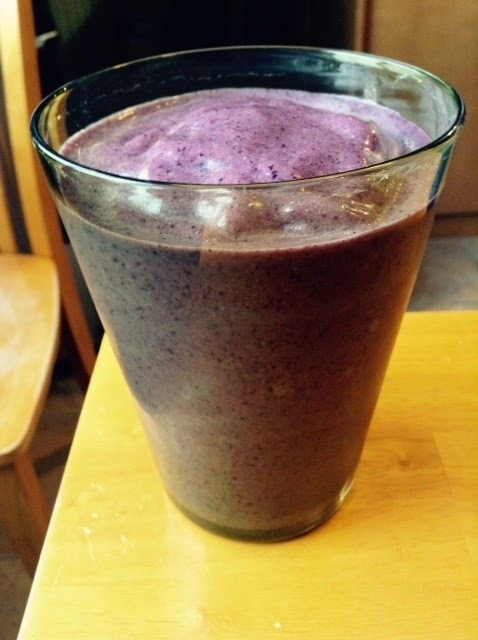 Normally I start my day off with a green smoothie, but I am out of ingredients, so I used up some of the frozen fruit stock I have (banana, blueberries), added my regular almond butter, hemp seeds, coconut oil, and water, and had a fruit smoothie instead. In general, I do not have meat, dairy, eggs, caffeine (outside of chocolate! ), alcohol, or refined sugar in my diet, but for the cleanse, I also remove gluten, soy, nightshade vegetables (potatoes, tomatoes, eggplant, peppers), and unrefined sweeteners (including chocolate!) for the month. I also focus on only home made food during the month of January and limit my processed food intake to rice cakes and occasional rice pasta. I like that the cleanse always helps me to start the new year off in a simple and back to basics way - I find it helps me to set a healthy and positive tone for the year ahead. I suspect the cleanse will be made up of mainly simple suppers, so there may not be many recipe postings, but I hope to focus on other ways to support and strengthen our overall health. For the 2015 cleanse, I am aiming to get more sleep. In a 2014 webinar on integrative strategies for supporting people diagnosed with breast cancer that I listened to, the teacher, Lise Alschuler ND, mentioned that women who routinely had less than 6 hours of sleep per night had a 62% increased risk of developing breast cancer than women who routinely had 7 hours of sleep per night. As a night owl and resulting chronic under sleeper, this information serves as a good signal to get my sleep habits more in balance and I plan to use the cleanse as a starting point.